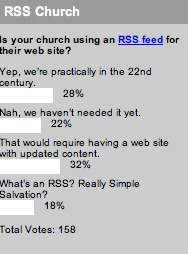 Last week, we asked you if your church was using an RSS feed for their web site. We’ve harped on RSS for your church before, and we were hoping that since then, more of your churches would have started providing RSS feeds. 28% of you are using RSS feeds for your sites. So about three of every ten churches provide a feed for their site. What sorts of things do you use this feed for? Messages? Events? Prayer Requests? Something else? 22% of you “haven’t needed it yet.” From the standpoint of someone who doesn’t visit web sites if they can help it, I read that as 22% of you don’t want to keep me in the loop. Another 32% of you don’t have an RSS feed because you don’t update your web site. Hey, Moses didn’t regularly update the stone tablets, so maybe you guys are doing the right thing on that. The final 18% of you are a little confused as to this whole RSS thing. You’ve seen that orange button before. You’ve heard me call out web sites that don’t have it (I’m looking at you, Barna). My best advice for you is to check out the Wikipedia article on RSS. Before you go check out that article or update your church’s web content, head over and let us know where your church most concentrates its marketing efforts. The new poll is up now. I’m surprised by that mega 30 percent, even knowing that it’s just CMS readers. Another hard poll to answer accurately, unfortunately. We no not use RSS for our website, but we DO have RSS for our Vicar’s blog. (Don’t all blogs use RSS?). This seems to work for us as the more dynamic content, the content that gets updated in chunks, is distributed via RSS, while the website, which is huge (some say daunting) and is continually updated, is more accessible via search engine. Geoffrey, sorry about missing that response on the poll. I like to keep them tough for you guys. You’re not missing anything – having a multi-faceted church website is a great idea, should have been an option! We have an RSS feed for our Mission Blog, Calendar Events, Messages Podcast, and Announcements. I’m not sure how many people use the feeds for anything other than the Podcast.